The Brooklyn Collection by MJL Furniture Designs is a collection of stunning and lavish, ottoman storage benches for the bedroom featuring flawless design and magnificent craftsmanship. Each ottoman storage bench is carefully designed and constructed by highly skilled and experienced hands, resulting in some of the finest pieces the industry has to offer. 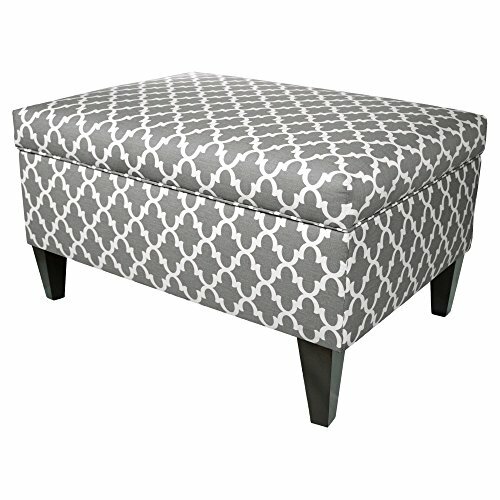 The Brooklyn upholstered, storage bench ottoman measures 22"W x 20"H x 30"L and weighs 30 lbs. Upon delivery of these padded and upholstered storage benches, assembly is not required. The storage ottoman bench is expertly constructed using the most resilient and enduring woods. The wood storage bench is then carefully upholstered with the softest, most luxurious fabrics . An endless variety of utterly alluring color and pattern combinations are available to adorn this elegant upholstered bedroom storage furniture. MJL Furniture Designs crafts and designs luxurious furniture using the finest, most resilient woods and soft, elegant fabrics. A combined 45 years of expertise, talent and experience ensures the impeccable and flawless nature of every MJL product. Every piece is proudly conceived, designed and manufactured in California, U.S.A.
CONSERVE SPACE: Each Wood Storage Ottoman Bench Measures 22"W x 20"H x 30"L and Weighs 30 LBS. This Upholstered, Ottoman Storage Bench Does Not Require Assembly Upon Delivery. STRUCTURAL ENDURANCE: The Upholstered and Padded Storage Bench Ottoman is Carefully Constructed From Solid, Durable Wood. It Has Been Designed for Optimal Quality and Endurance. STUNNING AND ELEGANT: These Storage Benches for the Bedroom Feature Fine and Elegant Upholstery of 100% Cotton. The Ottoman Bench Lid Features a Plush and Luxurious, Flame Retardant Filling . COLOSSAL STORAGE CAPACITY: This Impeccable Storage Bench Ottoman Boasts an Immense and Generous Storage Capacity. It is Designed to Accommodate a Variety of Bedroom and Living Room Storage Needs.